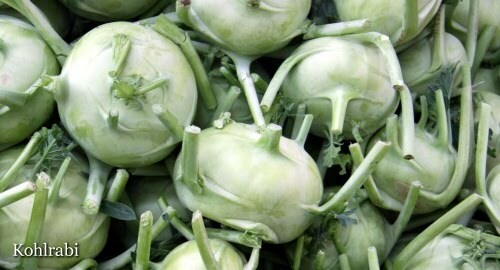 Kohlrabi tastes somewhat like the core of a cabbage. It's sweet and aromatic, with just a touch of bitter, but just a touch. If they're in season, they can be almost as sweet as a sweet onion. It is very popular in the middle east. If you find the small ones, they don't need to be peeled, but if they are larger than a first grader's fist, you need to take off their skin. For this recipe, you should try to get them with their greens. Just trim the tough spine from them up to where the leaves start. If you can't get them with the greens, you can use either cabbage or spinach to make up for their loss. Peel the kohlrabi and trim the stems off of the leaves. Julienne the kohlrabi on the wide setting of the mandolin, in a chips maker, or chopping by hand. Soak them in cold water for about half an hour. Chop the carrots and soak them as well. Cut up the leaves coarsely, and soak them in a little salt water. Meanwhile, chop the onions, garlic, chile, and parsley, and have them ready. Heat your pot on medium, and melt the ghee. Sweat the onions and chile together until the onions are almost clear. Rinse and then add the greens. Tossing gently, when the greens are tender, add the garlic and parsley. Stir a few seconds, and then drain and add the kohlrabi and carrots, and the spices and salt. Pour on enough water or home made broth to cover everything. Cover, and bring it to a boil. Then turn the heat down to medium-low or low, and let it simmer for about half an hour. If it's tender enough for you at that point, take it off the heat. If you like your vegetables very soft, give them another half hour. Serve hot as a vegetable course or a soup.